Live in a feeling of historic tranquility with modern amenities in this quintessential and beautiful Colorado mountain log cabin with stunning views from every window. The classic cabin airy floor plan opens to an expansive deck for drinking your morning coffee, watching sunsets or star gazing in the hot tub on cool mountain evenings. Wake up looking at the mountains, hike or ride your horse on 28+ acres, observe elk and hawks in their natural habitat, watch the snow fall through a 2-story wall of windows and sip hot chocolate by a stone fireplace. Lower level with family room and bedrooms on either side and all opening to a large patio with mountain views. Sit on the front porch and watch the colorful aspen leaves in the fall. A separate finished space with mountain views for an office, hobby area, shop and teen or guest hangout. 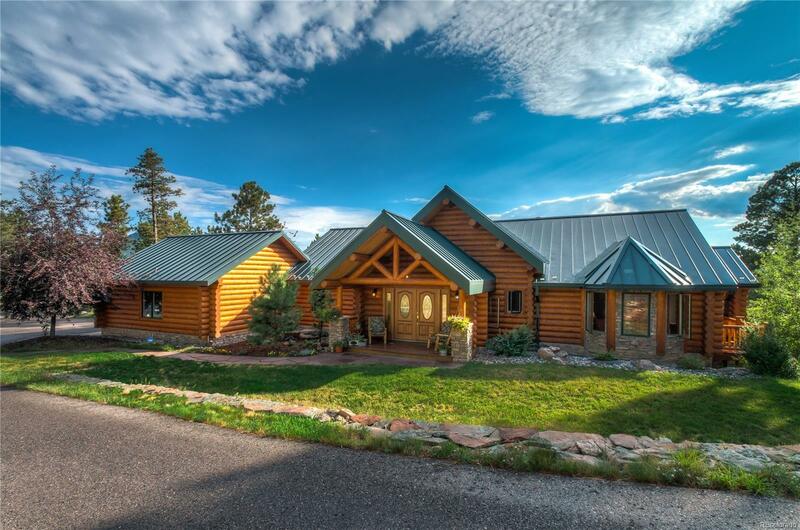 Featured as "Pleasant View" home on Log Home Living 2015. The perfect, peaceful get away from the city but within a short 15-minute commute to E-470.